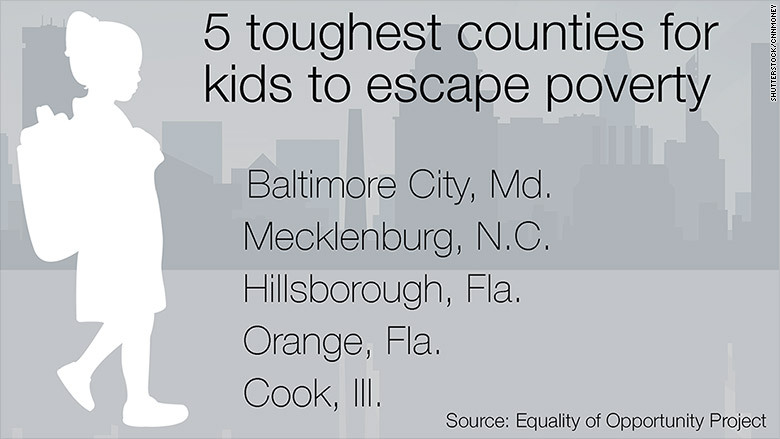 Baltimore is the toughest place in the country for poor children to escape poverty, a new study has found. The report, conducted by two Harvard economics professors, looked at how much children from low-income families earn when they turn 26. It found a wide variation among the nation's largest counties. Nationally, average household income at age 26 is $26,000. But young adults from Baltimore, the site of multiple protests and riots following the recent death of a young black man while in police custody, make 17.3%, or $4,500, less than that. Young men in Baltimore are hit particularly hard, bringing home nearly 28%, or $7,250, less. On the other extreme, poor children raised in DuPage, Illinois, have the best shot at climbing the economic ladder. The Chicago suburb is home to several large corporations, including McDonald's and Ace Hardware, and is one of the nation's wealthiest counties. 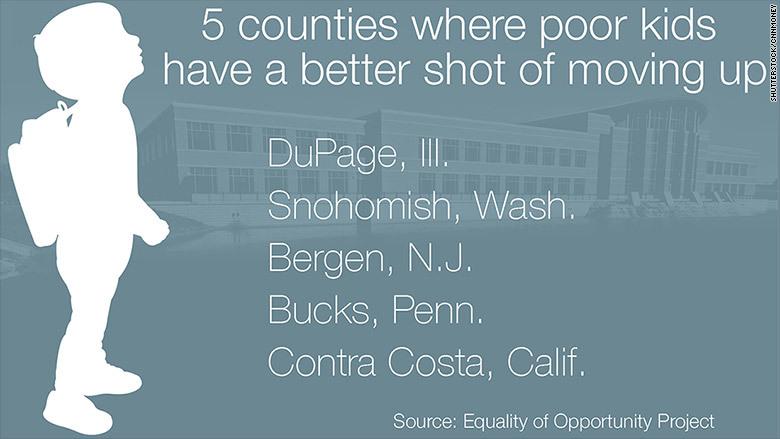 Children from poor families in DuPage grow up to earn 15%, or $3,900, more than the national average by the time they are 26. To conduct the study, Professors Raj Chetty and Nathaniel Hendren looked at tax records for more than 5 million children whose families moved from one county to another between 1996 and 2012. Their analysis showed that where children are raised does have an impact on their chances of moving up economically. In addition, the younger a child is when he or she moves to a neighborhood with more opportunity, the greater the income boost. Neighborhoods matter more for boys than for girls. Chetty and Hendren did not say why neighborhoods have such an impact on children's success. But it did find that counties with higher rates of upward mobility have five things in common: less segregation by race and income, lower levels of income inequality, better schools, lower crime rates and more two-parent households. The duo, along with Harvard Professor Lawrence Katz, also released Monday a second study that examined the impact of a federal program from the mid-1990s to move low-income families to better neighborhoods. It found that children who relocated when they were younger than 13 made 31% more, on average, than their peers whose families were not given vouchers to move. The relocated children were also more likely to attend college and less likely to be single parents. Just how much a child's neighborhood influences his or her circumstances as an adult has been a matter of debate among sociologists and economists, said Sean Reardon, a sociology professor at Stanford University, who was not involved in the report. The Harvard studies, however, indicate that it does have a substantial impact. "Where you grow up, above and beyond your family circumstances, seems to shape your educational and economic success as a young adult," Reardon said. When it comes to addressing the problem, Chetty and Henden offer some general recommendations. They suggested using housing vouchers to enable families to move to areas with lower poverty levels and the voucher programs could be targeted to families with younger children since they benefit the most from living in better neighborhoods. Since these children will earn more money and pay higher taxes as adults, the government will ultimately save money, the professors noted. 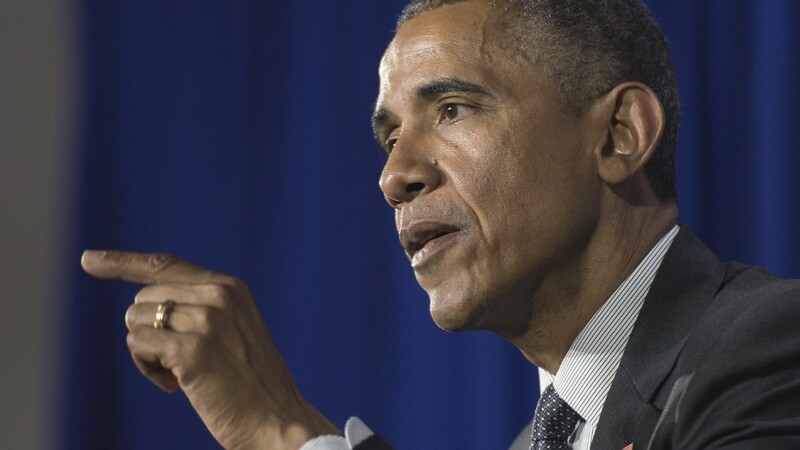 The government currently spends $25 billion subsidized housing vouchers. In the long run, however, it's most important to improve the schools and promote more mixed income neighborhoods, Chetty told journalists Tuesday. One solution is to use tax credits to encourage developers to build affordable housing in more middle class neighborhoods, not just in low-income ones. Noting that economic opportunity will be a key theme in the 2016 presidential campaign, Chetty said that issue cannot be solved by Washington D.C. alone. "If we are interested in tackling social mobility...we want to think about the problem at a local and not just a national level," Chetty said.